In honor of all men and women who have served our country thank you!! I understand commitment, I myself am in caring for people. as a RN 28 years next month and for the commitment you have made in keeping the USA safe, with any sacrifices you made, from the bottom of my heart thank you!! I dedicate this article to all acting and retired veterans. Happy Memorial Day weekend to all. The Mayo clinic states you can develop post-traumatic stress disorder when you go through, see or learn about an event involving actual or threatened death, serious injury or sexual violation. The way your brain regulates the chemicals and hormones your body releases in response to stress. 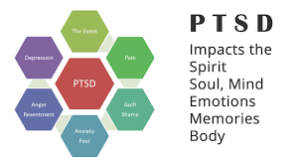 Posttraumatic stress disorder, or PTSD, can occur after someone goes through, sees, or learns about a traumatic event like: Combat exposure, Child sexual or physical abuse, Terrorist attack, Sexual/physical assault, Serious accident, Natural disaster, which can occur during areas of war or not. Most people have some stress-related reactions after a traumatic event. If your reactions don’t go away over time and they disrupt your life, you may have PTSD. During a traumatic event, you think that your life or others’ lives are in danger. You may feel afraid or feel that you have no control over what is happening around you. Most people have some stress-related reactions after a traumatic event; but, not everyone gets PTSD. If your reactions don’t go away over time and they disrupt your life, you may have PTSD. -How much help and support you got after the event. 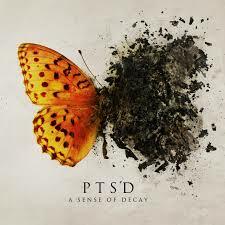 PTSD symptoms usually start soon after the traumatic event, but they may not appear until months or years later. They also may come and go over many years. If the symptoms last longer than four weeks, cause you great distress, or interfere with your work or home life, you might have PTSD. Whether or not you get PTSD depends on many things. Most people who go through a trauma have some symptoms at the beginning. Only some will develop PTSD over time. It isn’t clear why some people develop PTSD and others don’t. You may be jittery, or always alert and on the lookout for danger. Or, you may have trouble concentrating or sleeping. This is known as hyper-arousal. 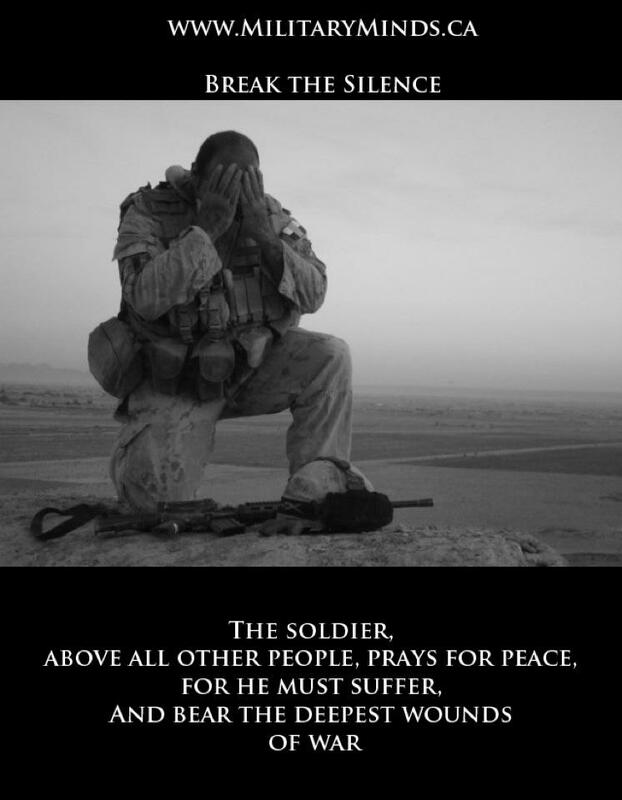 *Some Veterans begin to have PTSD symptoms soon after they return from war. These symptoms may last until older age. Other Veterans don’t have PTSD symptoms until later in life. *For some Veterans, PTSD symptoms can be high right after their war experience, go down over the years, and then worsen again later in life. *Many older Veterans have functioned well since their military experience. Then later in life, they begin to think more or become more emotional about their wartime experience. As you age, it is normal to look back over your life and try to make sense of your experiences. For Veterans this process can trigger Late-Onset Stress Symptomatology (LOSS). The symptoms of LOSS are similar to symptoms of PTSD. With LOSS, though, Veterans might have fewer symptoms, less severe symptoms, or begin having symptoms later in life. *The wars in Afghanistan and Iraq are the longest combat operations since Vietnam. Many stressors face these Operation Enduring Freedom/Operation Iraqi Freedom (OEF/OIF) troops. 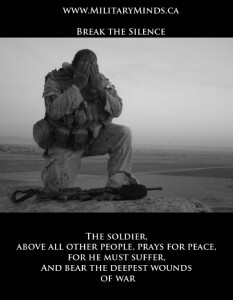 OEF/OIF service members are at risk for death or injury. They may see others hurt or killed. They may have to kill or wound others. They are on alert around the clock. These and other factors can increase their chances of having PTSD or other mental health problems. *For many service members, being away from home for long periods of time can cause problems at home or work. These problems can add to the stress. This may be even more so for National Guard and Reserve troops who had not expected to be away for so long. Almost half of those who have served in the current wars have been Guard and Reservists. *MST-Military Sexual Trauma is the term used by the Department of Veterans Affairs (VA) to refer to experiences of sexual assault or repeated, threatening sexual harassment that a Veteran experienced during his or her military service. Another cause of stress in Iraq and Afghanistan is military sexual trauma (MST). This is sexual assault or repeated, threatening sexual harassment that occurs in the military. It can happen to men and women. MST can occur during peacetime, training, or war. COMMON SIGNS AND SYMPTOMS OF PTSD: Anger and irritability, guilt, shame, or self-blame, substance abuse, feelings of mistrust and betrayal, depression and hopelessness, suicidal thoughts and feelings, feeling alienated and alone, & physical aches and pains. Also employment and relationship problems. In addition, the child who is deaf-blind will need help learning to move about in the world. Without vision, or with reduced vision, he or she will not only have difficulty navigating, but may also lack the motivation to move outward in the first place. Helping a young child who is deaf-blind learn to move may begin with thoughtful attention to the physical space around him or her (crib or other space) so that whatever movements the child instinctively makes are rewarded with interesting stimulation that motivates further movement. Orientation and mobility specialists can help parents and teachers to construct safe and motivating spaces for the young child who is deaf-blind. In many instances children who are deaf-blind may also have additional physical and health problems that limit their ability to move about. Parents and teachers may need to include physical and occupational therapists, vision teachers, health professionals, and orientation and mobility specialists on the team to plan accessible and motivating spaces for these children. Older children or adults who have lost vision can also use help from trained specialists in order to achieve as much confidence and independence as possible in moving about in their world. Education for a child or youth with deaf-blindness needs to be highly individualized; the limited channels available for learning necessitate organizing a program for each child that will address the child’s unique ways of learning and his or her own interests. Assessment is crucial at every step of the way. Sensory deficits can easily mislead even experienced educators into underestimating (or occasionally overestimating) intelligence and constructing inappropriate programs. 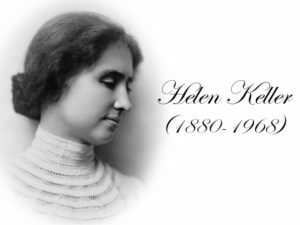 Helen Keller said, “Blindness separates a person from things, but deafness separates him from people.” This potential isolation is one important reason why it is necessary to engage the services of persons familiar with the combination of both blindness and deafness when planning an educational program for a child who is deaf-blind. Doing so will help a child or youth with these disabilities receive an education which maximizes her or his potential for learning and for meaningful contact with her or his environment. The earlier these services can be obtained, the better for the child. When a person who is deaf-blind nears the end of his or her school-based education, transition and rehabilitation help will be required to assist in planning so that as an adult the individual can find suitable work and living situations. Because of the diversity of needs, such services for a person who is deaf-blind can rarely be provided by a single person or agency; careful and respectful teamwork is required among specialists and agencies concerned with such things as housing, vocational and rehabilitation needs, deafness, blindness, orientation and mobility, medical needs, and mental health. The adult who is deaf-blind must be central to the transition planning. The individual’s own goals, directions, interests, and abilities must guide the planning at every step of the way. Skilled interpreters, family members and friends who know the person well can help the adult who is deaf-blind have the most important voice in planning his or her own future. Clearly, the challenges for parents, teachers and caregivers of children who are deaf-blind are many. Not least among them is the challenge of including the child in the flow of family and community life. Since such a child does not necessarily respond to care in the ways we might expect, parents will be particularly challenged in their efforts to include her or him. The mother or father of an infant who can see is usually rewarded with smiles and lively eye contact from the child. The parent of a child who is deaf-blind must look for more subtle rewards: small hand or body movements, for instance, may be the child’s way of expressing pleasure or connection. Parents may also need to change their perceptions regarding typical developmental milestones. They can learn, as many have, to rejoice as fully in the ability of their child who is deaf-blind to sign a new word, or to feed herself, or to return a greeting as they do over another child’s college scholarship or success in basketball or election to class office. Though deaf-blindness presents many unique challenges to both those who have visual and hearing impairments and to their caregivers and friends, these challenges are by no means insurmountable. 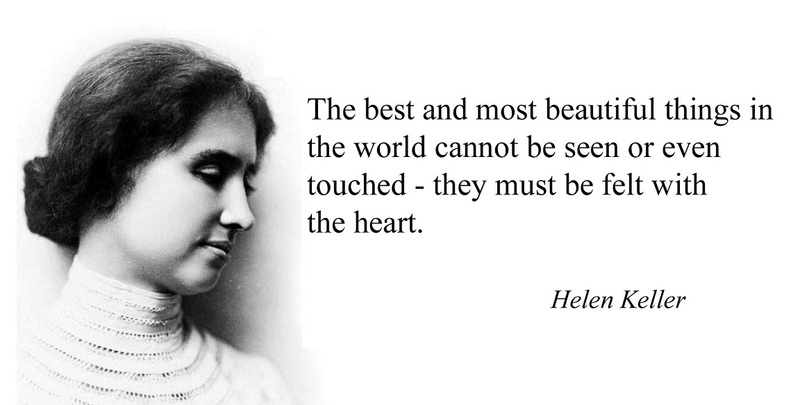 Many persons who are deaf-blind have achieved a quality of life that is excellent. The persons who are deaf-blind who have high quality lives have several things in common. First, they have each, in their own way, come to accept themselves as individuals who have unique experiences of the world, and valuable gifts to share. This fundamental acceptance of self can occur regardless of the severity of the particular sensory losses or other challenges that a person has. Second, they have had educational experiences which have helped them maximize their abilities to communicate and to function productively. Finally, these happy, involved persons who are deaf-blind live in families, communities, or social groups that have an attitude of welcoming acceptance. They have friends, relatives, and co-workers who value their presence as individuals with significant contributions to make to the world around them. For these persons with limited sight and hearing, and for those near them, deaf-blindness fosters opportunities for learning and mutual enrichment. Those unfortunately born with no sight and hearing face many challenges. It may seem that deaf-blindness refers to a total inability to see or hear. However, in reality deaf-blindness is a condition in which the combination of hearing and visual losses in children cause “such severe communication and other developmental and educational needs that they cannot be accommodated in special education programs solely for children with deafness or children with blindness” ( 34 CFR 300.8 ( c ) ( 2 ), 2006) or multiple disabilities. Children who are called deaf-blind are singled out educationally because impairments of sight and hearing require thoughtful and unique educational approaches in order to ensure that children with this disability have the opportunity to reach their full potential. A person who is deaf-blind has a unique experience of the world. For people who can see and hear, the world extends outward as far as his or her eyes and ears can reach. For the young child who is deaf-blind, the world is initially much narrower. If the child is profoundly deaf and totally blind, his or her experience of the world extends only as far as the fingertips can reach. Such children are effectively alone if no one is touching them. Their concepts of the world depend upon what or whom they have had the opportunity to physically contact. If a child who is deaf-blind has some usable vision and/or hearing, as many do, her or his world will be enlarged. Many children called deaf-blind have enough vision to be able to move about in their environments, recognize familiar people, see sign language at close distances, and perhaps read large print. Others have sufficient hearing to recognize familiar sounds, understand some speech, or develop speech themselves. The range of sensory impairments included in the term “deaf-blindness” is great. 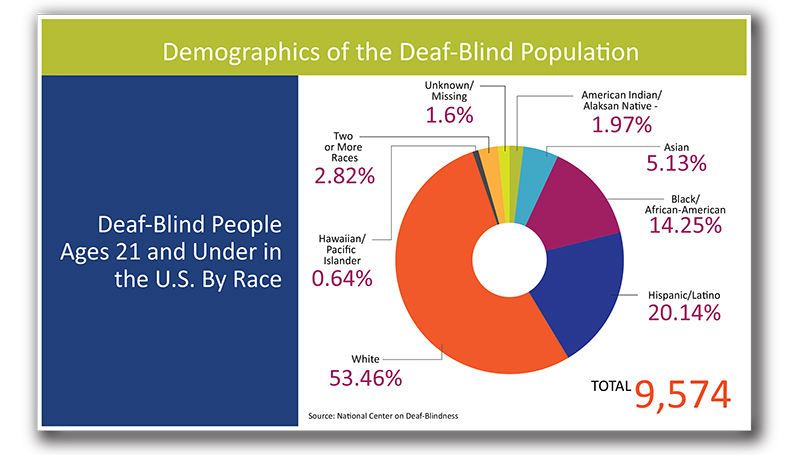 As far as it has been possible to count them, there are over 10,000 children (ages birth to 22 years) in the United States who have been classified as deaf-blind (NCDB, 2008). 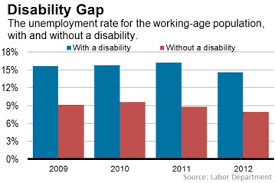 It has been estimated that the adult deaf-blind population numbers 35-40,000 (Watson, 1993). The causes of deaf-blindness are many. Below is a list of many of the possible etiologies of deaf-blindness. Multiple Congenital Anomalies- Like CHARGE Association, Fetal alcohol syndrome, Hydrocephaly, Maternal drug abuse and Microcephaly. Prematurity=Congenital Prenatal Dysfunction. Like AIDS, Herpes, Rubella, Syphilis and Toxoplasmosis. Post-natal Causes- Like Asphyxia, Encephalitis, Head injury/trauma, Meningitis and Stroke. The disability of deaf-blindness presents unique challenges to families, teachers, and caregivers, who must make sure that the person who is deaf-blind has access to the world beyond the limited reach of his or her eyes, ears, and fingertips. The people in the environment of children or adults who are deaf-blind must seek to include them—moment-by-moment—in the flow of life and in the physical environments that surround them. If they do not, the child will be isolated and will not have the opportunity to grow and to learn. If they do, the child will be afforded the opportunity to develop to his or her fullest potential. The most important challenge for parents, caregivers, and teachers is to communicate meaningfully with the child who is deaf-blind. Continual good communication will help foster his or her healthy development. Communication involves much more than mere language. Good communication can best be thought of as conversation. Conversations employ body language and gestures, as well as both signed and spoken words. A conversation with a child who is deaf-blind can begin with a partner who simply notices what the child is paying attention to at the moment and finds a way to let the child know that his or her interest is shared. This shared interest, once established, can become a topic around which a conversation can be built. Mutual conversational topics are typically established between a parent and a sighted or hearing child by making eye contact and by gestures such as pointing or nodding, or by exchanges of sounds and facial expressions. Lacking significant amounts of sight and hearing, children who are deaf-blind will often need touch in order for them to be sure that their partner shares their focus of attention. The parent or teacher may, for example, touch an interesting object along with the child in a nondirective way. Or, the mother may imitate a child’s movements, allowing the child tactual access to that imitation, if necessary. (This is the tactual equivalent of the actions of a mother who instinctively imitates her child’s babbling sounds.) Establishing a mutual interest like this will open up the possibility for conversational interaction. Teachers, parents, siblings, and peers can continue conversations with children who are deaf-blind by learning to pause after each turn in the interaction to allow time for response. These children frequently have very slow response times. Respecting the child’s own timing is crucial to establishing successful interactions. Pausing long enough to allow the child to take another turn in the interaction, then responding to that turn, pausing again, and so on—this back-and-forth exchange becomes a conversation. Such conversations, repeated consistently, build relationships and become the eventual basis for language learning. As the child who is deaf-blind becomes comfortable interacting nonverbally with others, she or he becomes ready to receive some form of symbolic communication as part of those interactions. Often it is helpful to accompany the introduction of words (spoken or signed) with the use of simple gestures and/or objects which serve as symbols or representations for activities. Doing so may help a child develop the understanding that one thing can stand for another, and will also enable him or her to anticipate events. Think of the many thousands of words and sentences that most children hear before they speak their own first words. A child who is deaf-blind needs comparable language stimulation, adjusted to his or her ability to receive and make sense of it. Parents, caregivers, and teachers face the challenge of providing an environment rich in language that is meaningful and accessible to the child who is deaf-blind. Only with such a rich language environment will the child have the opportunity to acquire language herself or himself. Those around the child can create a rich language environment by continually commenting on the child’s own experience using sign language, speech, or whatever symbol system is accessible to the child. These comments are best made during conversational interactions. A teacher or a parent may, for example, use gesture or sign language to name the object that he or she and the child are both touching, or name the movement that they share. This naming of objects and actions, done many, many times, may begin to give the child who is deaf-blind a similar opportunity afforded to the hearing child—that of making meaningful connections between words and the things for which they stand. Along with nonverbal and verbal conversations, a child who is deaf-blind needs a reliable routine of meaningful activities, and some way or ways that this routine can be communicated to her or him. Touch cues, gestures, and use of object symbols are some typical ways in which to let a child who is deaf-blind know what is about to happen to her or him. Each time before the child is picked up, for example, the caregiver may gently lift his or her arms a bit, and then pause, giving the child time to ready herself or himself for being handled. Such consistency will help the child to feel secure and to begin to make the world predictable, thus allowing the child to develop expectations. Children and adults who are deaf-blind and are able to use symbolic communication may also be more reliant on predictable routine than people who are sighted and hearing. Predictable routine may help to ease the anxiety which is often caused by the lack of sensory information. Stay tune for Part II tomorrow on other challenges. Summer ailment flare-ups due to hot weather. Hot weather has its hazards, from rip tides to shark scares to sunburn and close encounters with poisonous plants. Simply step outside on a hot summer evening and you’re bound to become instant mosquito bait. There are less well-known summer health hazards you should keep in mind. Hazards that affect your body from within. Here are some summer health ailments that get worse as the temperatures rise. Climate change is affecting not only our planet, it’s taking a toll on our health. Case in point: A University of Texas study has found that the incidence of kidney stones will increase in step with rising record temperatures. Researchers predict a huge increase in kidney stones by 2050. To help prevent kidney stones, which are made up of mineral and acid salts, the Mayo Clinic advises staying well-hydrated (which also will help protect you from heat stroke) when the weather’s sultry. It’s important to keep levels of protein, sugar and sodium (especially) in your diet low. Note that if you live in a warm part of the country or tend to sweat a lot, you may be at higher risk of kidney stones. 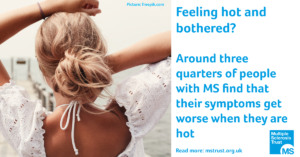 As the temperature rises, so does the risk of migraine for someone who’s prone to them. A study of more than 7,000 emergency room patients who came in for migraine symptoms during a seven-and-a-half-year period revealed that for every 9 degree F bump in temperature, migraine cases increased. 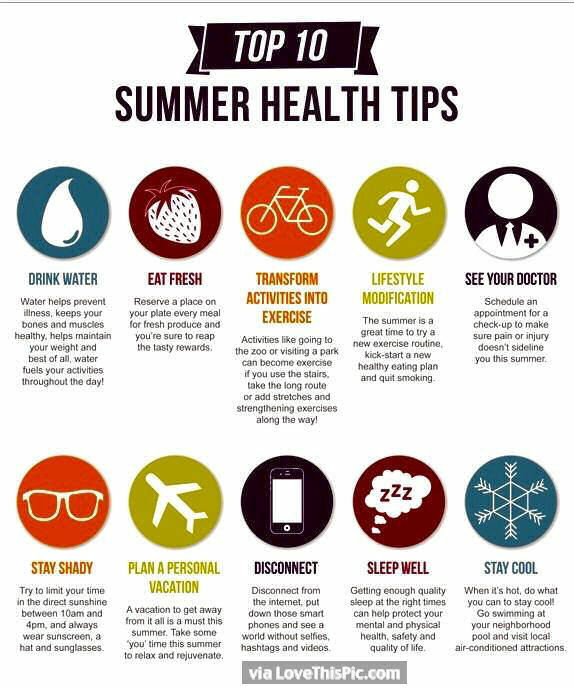 To head off migraines in summer, the Cleveland Clinic advises staying hydrated (rely on water and other non-caffeinated beverages) with eating regular meals no matter how busy you are (your bike partner can wait) and steering clear of common migraine triggers if they affect you. Some you’re likely to encounter in summer are like hot dogs, pickles, beer and certain cheeses. Sun exposure, elevated temperatures and wind — hallmarks of summer weather — can bring rosacea flare-ups. If you have rosacea, a skin condition that causes redness, bumps, eye irritation and thickening of skin around the face and other parts of the body, fend off flare-ups! Apply sunscreen at least 30 minutes before heading out and reapply every couple of hours. Add a wide-brimmed hat and a good pair of shades protect your face and eyes from UV rays. Winter may be peak season for heart attacks, but summer heat also can take a toll on people with cardiovascular disease or who are at risk for it, according to the American Association of Heart Failure Nurses (AAHFN). That’s because high temperatures increase heart rate and lower blood pressure. Folks with weak hearts may not be able to pump enough blood to cool their bodies and can quickly become overheated. If you have heart problems, the AAHFN recommends you stay inside on blistering days, make sure you drink enough fluids (and back off of caffeine and alcohol) to keep you hydrated and have someone on speed dial who can get to you quickly if you need help. Summer whims can spell trouble for people with asthma. When air temperatures change suddenly — as when the thermometer plummets just before a thunderstorm — it can bring on asthma symptoms, according to the American Lung Association. Asthma sufferers also may have trouble breathing in outdoor air pollution as well as when ozone levels are high, which occurs more often in the summer. If you have asthma, your best protection is prevention: Keep a check on daily air quality and, if you live in a city, heed the smog warnings that often occur on steamy days. If the weather outside seems frightful, stay indoors as much as possible. Exposure to ground-level ozone can exacerbate chronic respiratory symptoms, reduce lung capacity and be a trigger for asthma attacks. Other conditions affected by high ozone levels in the summertime include COPD, heart disease and diabetes. Yes those of us suffering from eczema understand very well that winter months can be the toughest time of year – dry air, cold temperature, low humidity making skin susceptible to eczema breakouts and flares. Remember that also here’s a plenty of sunshine, high humidity and warm temperature. All weather conditions that is ideal for eczema. Hot weather makes everyone sweat more. Sweating is our natural defense mechanism to control the body’s temperature. Sweat consists of mostly water. As water evaporates from the skin surface, it provides a natural cooling sensation and also lowers the body temperature. In addition to water, there are trace amounts of sodium, potassium, calcium, magnesium, lactic acid, urea, copper, zinc, nickel, iron, chromium and lead in the sweat. Many of these chemicals, if presented at a high enough concentration, may be irritating to the skin. Hot weather worsens the itch, blockage of sweat glands, and other bad summer exposures are chlorine it can wreak havoc on your skin and hair. For one thing, chlorinated water can definitely dry out your skin. Also, to prevent skin cancer, premature aging, and sunburn, it is a good idea to use sunscreens. 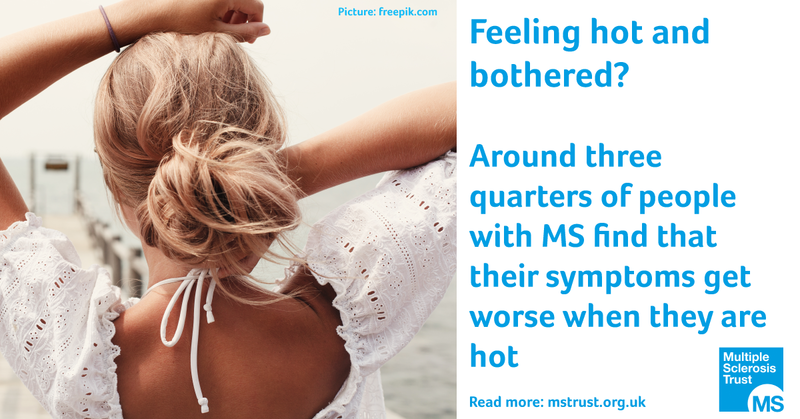 Sinusitis and Headaches in hot weather! During summer and on those very hot days it is marvellous to go to the beach, relax at the pool side, have a barbeque or even picnic out with friends and family but then you may notice that your nose starts to run, you suddenly develop a headache or you feel stuffy. Sinuses, which are paired air spaces connected to your nose, is lined with very delicate skin called the mucus membrane. The mucus membrane may then become inflamed by many things like bacteria, colds and flu’s, allergies or even a fungus invasion. We start to feel all those dreadful symptoms when these sinus spaces are blocked, causing mucus build up and pressure. The most common culprit of summer sinus problems is allergies and hay fever. We don’t hear enough about how pet hair, pollen, dander, dust and dust mites and even milk or how certain food allergies cause sinus problems. But what else about those hot days cause our sinuses to go ballistic? One often hears about sudden extreme temperature changes causing increased sinus pain and a stuffy or runny nose, but how? There are millions of tiny hair like structures called cilia that make up the mucus membrane, which lines your nose and sinuses. These cilia work together as a broom, helping to get rid of stagnant mucus that may block the sinuses. Your mucus membranes prefer a moist warm environment as opposed to it being very cold or very hot. On hot summer days the air is very dry causing the mucus in your nose to become thick and sticky. This makes it difficult for the cilia to move or “sweep” the excess mucus out. This thick mucus then blocks the sinuses. When mucus flow is interrupted or blocked, it often becomes hard in nature and causes pressure and congestion. The pressure and the congestion then cause you to experience pain, stuffiness and headaches. Viral sinus infections are the most common type of sinusitis. 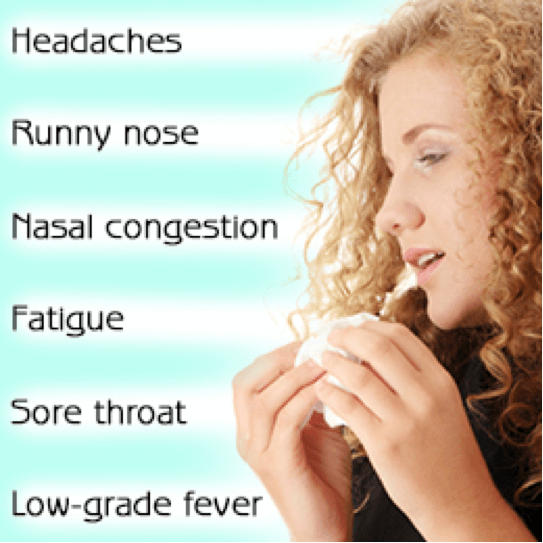 Viruses that cause the common cold are usually the reason for the sinus infection. The symptoms of a viral sinus infection typically last up to seven to ten days. The first few days your symptoms will worsen and after about the fifth day you may start to see improvement. These types of sinus infections generally go away on their own with rest and vitamin C. The symptoms you may experience while having a viral sinus infection are headaches, congestion, low fever, nasal discharge, and trouble sleeping. If your cold is lingering around and does not runs its course naturally you may actually have a bacterial sinus infection. Learn the signs that indicate your cold may be a bacterial sinus infection. Viral sinus infections do not require antibiotics. When you experience any type of sinus infection it will more than likely be a viral sinus infection. Bacterial sinus infections are less common than viral sinus infections. It may be difficult to tell the difference between bacterial and viral sinus infections because they share common symptoms. In some cases a viral sinus infection can develop into a bacterial sinus infections. This occurs when bacteria multiplies in fluid-filled sinus pockets. Bacterial sinus infections may also resolve on their own but may require antibiotics to fight off the bacteria. Signs that your viral sinus infection has increased to a bacterial sinus infection are a noticeable increase in the severity of symptoms or failure to get better after seven to ten days. Some common symptoms of bacterial sinusitis are worsening congestion, more severe facial pain, and thickening or increase of nasal discharge. Bacterial sinus infections can also return shortly after your symptoms have healed, making you think, why do I keep getting sinus infections? If your nasal discharge or mucus is thick, dark, and/or greenish-yellowish, you may have converted to a bacterial sinus infection. Evaluation by your doctor can determine whether or not you have a bacterial or viral sinus infection. If your symptoms show no sign of improvement after ten days it is safe to say you have developed a bacterial sinus infection.